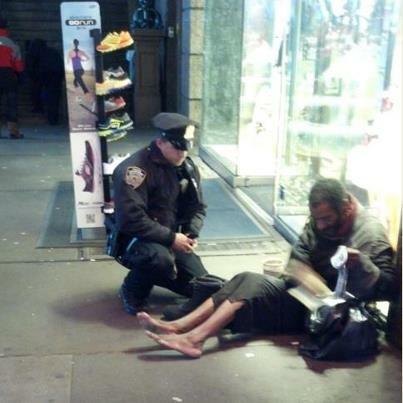 Photo of New York Police Officer Giving Boots to a Homeless Man-Truth! - Truth or Fiction? This is a photo that went viral on the popular network site, Facebook, showing a New York police officer giving boots and socks to a barefoot homeless man. The photo is real according to a November 28, 2012 article in the New York Times. The photo was taken by a tourist, Jennifer Foster, from the state of Arizona with a cell phone camera, which she later posted to the New York Police Department fan page on Facebook.